The Guide to Get Rich: Getting Rid of Taxes by Imitating the Rich! The book of the week was another from the Rich Dad Series, Own Your Own Corporation by Garrett Sutton. 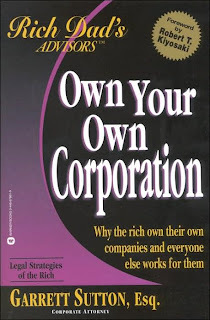 This book has a simple purpose, to inform the reader the differences between the most popular forms of corporations and how to get them off the ground. If you read my blog about the book Rich Dad, Poor Dad by Robert Kiyosaki, you would understand the benefits of starting your own corporation. I suggest you read it if you haven’t already. Sutton makes it very clear not to start a sole proprietorship and general partnership. These two entities offer no personal protection. The good types of corporations are C corporations, S corporations, Limited Liability Companies, and Limited Partnerships. Each of the "good types" offer great asset protection, which means, if your company gets sued your personal assets are safe. You will only be risking the assets that are in the corporation’s name. I think this book was really good for someone that has intentions of starting up a company. If you don’t have this goal in mind, I wouldn’t worry about picking it up. Read Rich Dad, Poor Dad first, and see if starting your own corporation is really for you. This gives you the jump start you need if you want to live like the "rich" do i.e. not pay taxes and having self sustaining cash machines in your life. I think that having this in your life is the best way to retire truly wealthy. Sutton’s book is very detailed and it’s a lot of information to take it, which is good if you are going to keep up with all the legalese your lawyer may throw at you. I am a big advocate of having background information on any subject I might need help with. Whether it is law or accounting, you’ll spend a lot less money on your advisers if you go strapped with knowledge. If you have any questions on the book don't hesitate to ask. I would be more than happy to help anyone that wants it. Read this book on a number of occasions Trevor, and it has been very helpful. I still use it as a reference when I have questions about corporate structure and governance. I can't wait till I can have a full-time corporate lawyer to focus on my business only though.